(Nanowerk News) Scientists at the U.S. Department of Energy's Argonne National Laboratory and the University of Chicago have reached a milestone in the study of emergent magnetism. Studying simple metallic chromium, the joint UC-Argonne team has discovered a pressure-driven quantum critical regime and has achieved the first direct measurement of a "naked" quantum singularity in an elemental magnet. The team was led by University of Chicago scientist Rafael Jaramillo, working in the group of Thomas Rosenbaum, and Argonne scientist Yejun Feng of the Advanced Photon Source. University of Chicago scientist Rafael Jaramillo and Argonne scientist Yejun Feng examine the element chromium at the Advanced Photon Source. Studying simple metallic chromium, the joint UC-Argonne team has discovered a pressure-driven quantum critical regime and has achieved the first direct measurement of a "naked" quantum singularity in an elemental magnet. The sophisticated spin and charge order in chromium is often used as a stand-in for understanding similar phenomena in more complex materials, such as correlated oxides proximate to a quantum critical point. 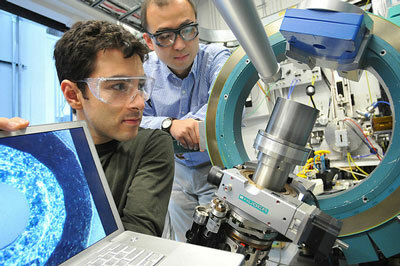 "Chromium is a simple metallic crystal that exhibits a sophisticated form of antiferromagnetism," said Jaramillo. "The goal was to find a simple system." Quantum criticality describes a continuous phase transition that is driven by quantum mechanical fluctuations, and is thought to underlie several enigmatic problems in condensed matter physics including high-temperature superconductivity. However, achieving a continuous quantum phase transition in a simple magnet has proved to be a challenging goal, as the critical behavior in all systems studied to date has been obscured by competing phenomena. The discovery of a “naked” transition in simple chromium metal therefore paves the way for a more detailed understanding of magnetic quantum criticality Like many elements, chromium has been extensively studied for decades and a discovery of this magnitude in an element is particularly important. "It's not often that you find out something new in an element," Feng said. The pressure scale and experimental techniques required to measure quantum criticality in chromium necessitated extensive technical development at both Argonne and the University of Chicago. The resulting techniques for high precision measurement of condensed matter systems at high pressure, developed for use at Sector 4 of the Advanced Photon Source, now approach a level of precision and control comparable to more conventional techniques such as magnetic varying field and temperature. This work is reported in the May 21 issue of the journal Nature.